What is the state of My Heart when I hear the Qur’an? “Allah has sent down the best statement: a consistent Book wherein is reiteration. The skins shiver there from of those who fear their Lord; then their skins and their hearts relax at the remembrance of Allah. That is the guidance of Allah by which He guides whom He wills. And one whom Allah leaves astray – for him there is no guide”. Like most Muslims across the globe, all my life I could not understand the Arabic language and the text of the Qur’an. Even when I read the translation I was unable to comprehend the in-depth meaning of the ayahs (verses). But having said that, the recitation of Qur’an is always a source of hope and tranquility for the Believer and so was my case. However, now that I have Alhamdulillah, become a full-time student of the Qur’an, it is almost as if doors to another realm of existence have opened up to me! After going through the translation, word analysis and tafsir (exegesis of the Qur’an) of a surah, listening to its recitation takes on a new meaning in the true sense of the word. I can understand what is being recited, why the qari (recitor) is repeating certain verses and why he would even weep at some verses. Masha’Allah, after the lessons, the recitation can really be heartfelt. Sadly, my understanding is still at the most minimal level as I have recently started with the detailed study of the Qur’an. Hence, I have yet to understand most of the Qur’anic recitation. On a positive note, the other day I just sat down for a breather post iftar (breaking of fast). My kids had found something to keep themselves busy and I thought to myself that I should quickly watch some TV to unwind (after all I never really get to do it). 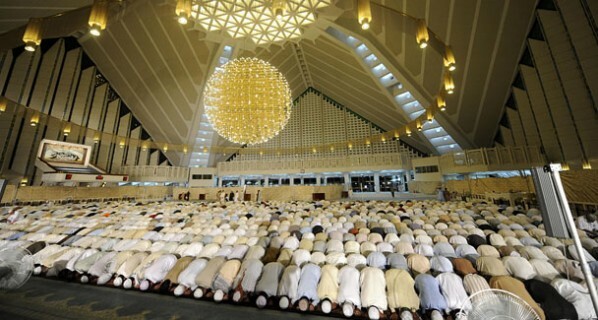 I started flipping the channels and on the second or third channel a Mehfil-e-Shebina was being telecasted live from Faisal Mosque, Islamabad. It was almost as if my hand froze and I could move no further to surf other channels and their offerings. The imam was reciting the 11th juz, which I have not covered in my course. I could barely grasp a couple of words and phrases in between but the impact was amazing. It was the most soothing thing I could ever hear! After a while I had to get up to do the chores around the room and settle the kids but the experience stayed with me. Alhumdulillah, for this taufiq and may Allah (سبحانه وتعالى) fill my heart with guidance and emaan (faith). Ameen. I am still far away from true taqwa (fearing Allah سبحانه وتعالى) where my eyes should weep when I read about the horrors of hell and the wrath of Allah (سبحانه وتعالى). And when the affairs of the world test me and I am in despair the ayahs of Qur’an should become my true strength. I pray to Allah (سبحانه وتعالى) to take me to that level of emaan (faith), Insha’Allah. This entry was posted in Reflections and tagged Az-Zumar, Condition of the heart, Eeman, Hearing Qur'an, Understanding Qur'anic Arabic. Bookmark the permalink. 3 Responses to What is the state of My Heart when I hear the Qur’an? This is a nice reflection of how we should feel when we hear the tilawat of the Holy Quran and how our heart should feel when we are listening to the Quran. It is important for us to implement the Holy Quran into our daily lives and we should follow the Quran and the Sunnah of Prophe Muhammad (pbuh). The sahabah used to cry when they would recite the Qur’an.They fully understood the Qur’an as well as the true purpose of their lives.I really hope that the recitation of Qur’an trembles our hearts and we cry. Great feeling of recitation and reading of Quran is describe in this post.one could become spritual and clean by heart when he/she recite the verses of Quran.Well me read Quran daily, and at fajar time after praying i do talawat and i feel very happy and peace in my heart after doing these spiritual and rewarded things and Allah will definetely reward and happy from that type of person.